The Douro River is one of Europe’s most western rivers, flowing through Spain and Portugal into the Atlantic Ocean. On a Douro River cruise, you’ll see restored palaces, historic cities, steeply-terraced vineyards and picturesque rural villages along one of Europe’s most charming and relatively lesser-travelled rivers. Over the centuries, the Douro has carved a spectacularly wild and scenic valley through the Portuguese Highlands. As a result, it has also created its own Mediterranean-like microclimate, making it perfect for growing olives, almonds, oranges, figs, peaches and the valley’s most famous produce, grapes. The Douro Valley is the world’s oldest designated wine-producing region with Port being its most famous export. Most of us have heard of Mateus Rosé! This iconic frizzante rosé wine is still being produced by the same family, but it has been made less sweet and more sparkling to meet modern wine tastes. 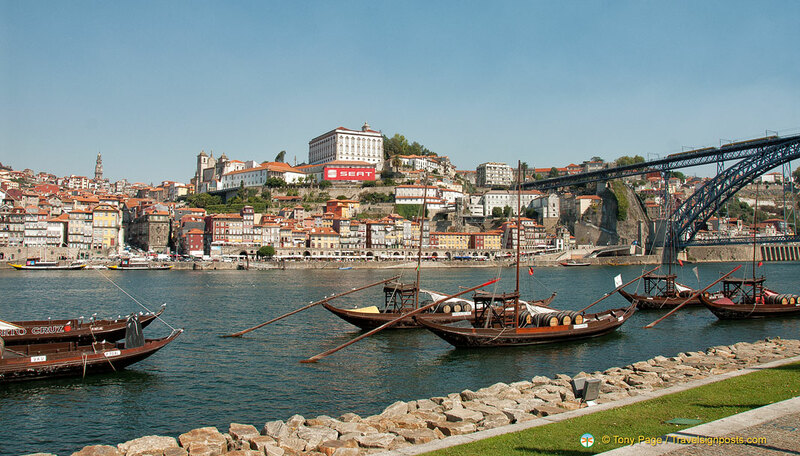 All Douro River cruises start or finish the river section of their itinerary in Porto, founding place of Portugal’s famous port wine and the ‘City of Bridges’. Although many actually begin/end in the Portuguese capital, Lisbon, and visit Coimbra, Portugal’s third largest city and the birthplace to six of Portugal’s kings, these parts of the itinerary are covered by motorcoach, as is the visit to Salamanca in Spain. In Porto, drop into a local cellar and enjoy a glass (or two) while learning about making and trading port. Your cruise on the Douro River follows a wonderfully scenic path through deep-cleft gorges terraced with vineyards, past sleepy villages and a tranquil countryside of almond and citrus trees to the Spanish border. Along the way, explore pousadas and quintas, pilgrimage sites and vineyards. This is probably one of the most comprehensive and enjoyable ways to see these areas of Portugal and Spain. Typical excursions along the way might include the 14th century Alpenduranda Monastery, a visit to the famously baroque Casa de Mateus (still owned by the Count of Vila Real), Lamego’s Gothic cathedral and 11th century castle, and a trip to the Spanish city of Salamanca, home to one of the oldest (13th C) universities in the world (Copernicus taught here) and one of Europe’s most impressive squares. OUR ADVICE: The major cruise operators such as Uniworld, Viking, AmaWaterways, offer cruises on the Douro river and although there are now other players working the Douro, it is not overrun by river cruises as on the Rhine and Danube. Concentrate on the ship you want to travel on and the destinations visited (of course, there’s also price!). Be sure to check out our “Things to watch for“ page too! So, what is your thought on this? Let me know! This first photo with the beautiful bridge is captivating! May I know what city this is? Thank you for your lovely site, it’s a pleasure to visit! 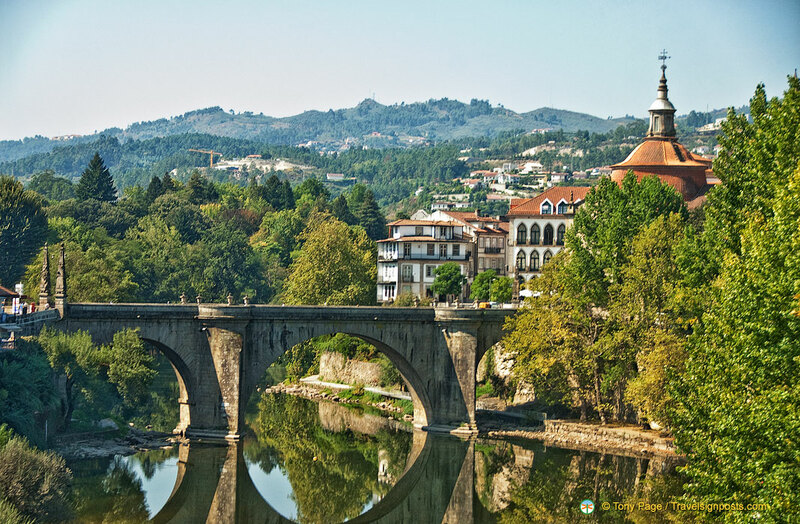 It’s taken from the new bridge crossing the river Tamega looking towards the old single carriageway stone bridge to the city of Amarante, well worth the detour as the whole district is quite attractive. And many thanks for your kind comments, it makes our work worthwhile!